We're still studying Native Americans.... It seems like we've been in this unit for a while now but we're finally getting ready to wrap things up next week! As a end of unit activity, small groups were assigned one of the cultural regions. They will become "experts" and teach the class about the culture of that region. Then as a visual, they created mosaics that also show us something about that region's way of life. I will be projecting their final mosaics on the SMARTboard so that all students are able to see the finished masterpieces. Here's the direction sheet that the students were given... However, first credit and a great big THANK YOU goes to Mrs. Brewer who created this project! Students could use the textbook or an electronic device (if they had one) to look up information on their specific cultural region. Our textbook lists out seven different regions. The state of Ohio refers to nine different regions - as the teacher you can decide how you want to assign groups or split up the kids. I decided to do the seven regions from the textbook so all groups could have access to information and then teach the Arctic and Subarctic separately. We talked about mosaics and students discussed examples they had seen in their lives. Luckily, the primary building has large mosaics on the wall. Score! Then, we talked about the materials they would be using. Since, I was fresh out of tile, glass, and quartz -- they would be using a variety of construction paper to create their mosaics?! The confused looks are wonderful. I explain that they will be ripping up little bits of paper to create their artwork - just like a real artist needs to fit together all the pieces in a mosaic. It's a great project and the look amazing! We will be discussing that "sunny" is not a climate - but besides that, I'm impressed! Here are some of my finished masterpieces from this year! Students will share their mosaics and then other students will take notes on the climate and ways of life of each region. Each group will get essentially be the teacher for a day (15 minutes) and share their work and region! It's always a fun project and a great stress relief for the students! Plus, I charge class dollars for construction paper on the floor so my floors are always spotless even after a shredding frenzy! 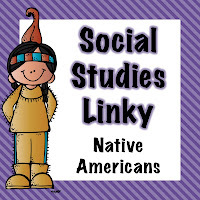 Don't forget to link up with Diane at Fifth in the Middle with your Native American lesson ideas! Oh, these are so cool! Thanks for linking up! There are lot of organization held the taring session at different location so students attend the taring session and help out in future when start the job. Mostly students view professional essay writing services for improvement your skills and also help in major part of study. Hmmmm, it is very interesting informatio and I want to know about such native Americans! I noticed some people who always ask for best writing services for their papers. After doing a big search over internet they get tired but I have best tip for these frustrated people. Now they can ask for customer writing services from online writers who are ready to serve you according to your expectations.